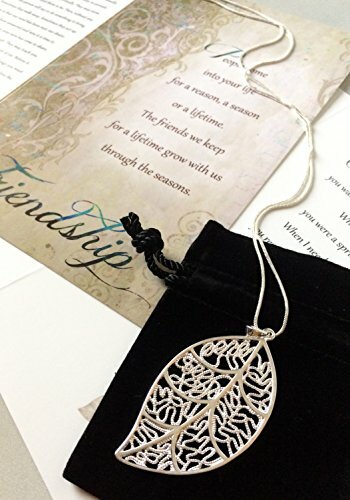 PACKAGE CONTAINS - Silver plated leaf necklace with a 24 inch silver plated snake chain, greeting card, envelope, and sealing sticker. The necklace comes in a soft premium black velvet bag lined with black satin. Packaged in transparent blue 6" x 8.5" button bag. -- Smiling Wisdom was created to help others find the words to make better connections with friends and family. Its mission is about giving something away, touching someone's heart and inspiring others-for no reason at all. Each product is designed by the owner, an artisan who puts her words and artistry together with heart and mindfulness. Each gift is about bringing joy to someone important in your life. The messages are encouraging, compassionate and heartfelt. The beautiful packaging is a big part of the overall experience. If your heart is touched, you have feedback or inspiration-we'd love to hear from you. FRIENDSHIP GREETING CARD - ~5x7 inches, 110# paper, envelope and sealing sticker. A beautiful sentiment for a meaningful friendship. The back of the card is a poem by an unknown author that inspired this greeting card. Printed and made in USA. RELATED GIFTS - To see other Smiling Wisdom products, click on the Smiling Wisdom link above the product title on this page. If you have any questions about this product by Smiling Wisdom, contact us by completing and submitting the form below. If you are looking for a specif part number, please include it with your message.